Wake up bright with food that gives you nourishing energy. 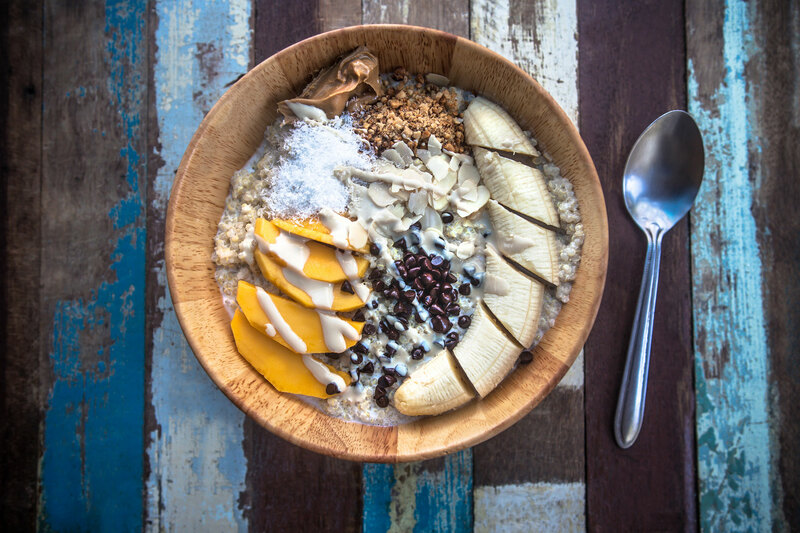 Nutritionist Zoe Bingley-Pullin shares some deliciously healthy breakfast ideas. Those of us who aren’t ‘morning people’ can likely understand that some days, it’s a real struggle to get up and going, let alone feel enthused about the day ahead. Thankfully how you fuel your body and what you choose to eat, especially at breakfast time, can help make the mad morning rush less of a chore. When we wake up, cortisol (the ‘stress’ hormone, though in this context it’s healthy and necessary) starts to rise and oppose melatonin (the 'sleepiness' hormone). Essentially, cortisol helps us get out of bed to start the day. We may also wake feeling hungry from our overnight fast or lacking energy and stamina. Food has an important job in the body at this time. A good, nourishing breakfast will help to replenish glycogen levels, keep blood sugar in check, start the digestive system, satisfy hunger and provide fuel for the day ahead. If you start the day with a poorly balanced breakfast, you may experience a negative impact on your energy levels and cognitive functioning, and it may even lead to overeating later on in the day. Here are a handful of foods you might not have thought of that make energising additions to your breakfast. Tofu offers a powerhouse of nutrition to start the day off with. This includes protein to help stabilise appetite and iron to support the formation of red blood cells and cellular energy production. It’s a great option for vegetarians and those who can’t stomach other forms of protein in the morning. Make sure to eat alongside a source of vitamin C such as tomato, lemon juice, capsicum or spinach to help with iron absorption. Adding some fresh papaya to your breakfast not only tastes delicious, but also offers a source of vitamin C, which helps support healthy cortisol production. As discussed, cortisol is necessary in the right amount to help wake you up in the morning. Along with vitamin C, papaya is rich in other antioxidants, which may help to improve cognitive function and memory. Papaya also contains the enzyme papain, which helps to break down proteins and may support digestion. Oat bran gets a lot less attention than oats, but it offers lots of health benefits. Oat bran is essentially made from the layer of cells found under the oat husk, and it's very high in fibre. This means you will feel fuller for longer after breakfast, and it will help to keep energy and concentration stable. Oat bran is also a good source of B vitamins, which also help to support energy production. If you haven’t tried hemp seeds before, breakfast is the time to do it. Hemp is a good plant-based source of omega-3 essential fatty acids. These fats are called ‘essential’ because the body cannot make its own supply and we must get an adequate intake through our diet. Including healthy fats in meals helps to keep us satisfied from the foods we eat, and therefore helps to support energy levels. Omega-3s are also linked to improved mood. Now that you know some helpful foods to consume at breakfast, here are some healthy and delicious ways to enjoy those foods. Scrambled tofu, spinach and avocado on 1-2 slices of sourdough or seeded bread. 2 eggs scrambled with herbs, goats cheese, hemp seeds, tomato and turmeric, served with 1-2 slices of sourdough or seeded bread or roasted sweet potato. A smoothie containing complex carbs, fats and protein – this balance makes it more of a meal. For example, try frozen banana, avocado, hemp seeds, chia, raw nuts or seeds or plant-based protein powder, milk of your choice, ½ tablespoon oat bran and some added nutrition such as berries, spinach and turmeric. 1-2 slices of sourdough or seeded toast with hummus, avocado, tomato and pan-fried tofu. Chia seed pudding topped with fresh fruit, nuts and seeds. A bowl of diced papaya and blueberries, topped with thick Greek yoghurt (or coconut for a dairy free option), hemp seeds and oat bran. Food aside, you're probably thinking, "But what about coffee?" If you rely on caffeine to get you going in the morning, this is not all bad. Caffeine, in the form of coffee, green tea or matcha powder, is a good source of antioxidants and can boost mood and cognitive performance. However, I would shy away from consuming caffeine if you are sensitive to its effects and if it leads to anxiety or nervousness. Avoiding caffeine on an empty stomach may help reduce negative effects and the best time to drink it is mid-morning when cortisol usually starts to decline.